I'm staggered on a near-daily basis at the intellectual resources the net puts at our fingertips. Flickr has a collection called The Commons - "help us catalog the world's public photo archives." Museums, NASA, libraries, government entities - don't click that link if you want to get much work done. Since we're not far from Vancouver B.C., I was curious to see what the University of British Columbia had put into the mix. Prints from the 18th century. Photos from the 19th century. Here's the link: UBC Library Digitization Centre. The historical materials from Japan, in particular, are phenomenal. Letters, maps, prints, battle maps - artifact after artifact. I'll limit myself to one example, because it's so beautifully done. The tsunami in Japan four years ago was horrifying, of course. It's happened before. This visual story about the Tsunami of 1896 packs so much drama in one visual. (Click for large image). I don't read Japanese; drop me a line if you care to translate any of the language. I'll add the translations here. "The Cyber Risk Summit brings together cyber security specialists, technologists, entrepreneurs, industry experts and business leaders to tackle the challenges and opportunities that come with cyber security strategies. Featuring break out sessions keyed in for your needs connecting with peers and strategic insights, this is a day you can't afford to miss. Attendees from Human Resources, Accounting, and Legal departments can receive continuing education credit for attending and following a discipline specific curriculum." If you're in Washington State or B.C., you'll want to be here. This is cutting-edge stuff, and the indefatigable TAG org has pulled in a who's-who of speakers. Mark R. Anderson (SNS), in person - I'd drive across the state to hear him talk, any day. Mark Wallach of the FBI, Michael Cockrill of Office of the CIO for Washington State - zowie! We explained some really arcane cybersecurity stuff a few years ago - bringing topics that abstract to life is very challenging. I'm the caboose for the day, trying to summarize on the fly. It's going to be intense and interesting - and probably a bit unnerving. See ya there. Think about this one for a sec. You think they shot & edited that video, about video-making with an iPhone, on an iPhone? I don't know the answer, just struck by the possible irony. This explanation video from IBM Research is terrific. They turned the MRSA antibiotic-resistant staff strain into an engaging story. Someone did a heroic job of resisting the corporate urge to pile on details and technicalities. I particularly like that they left the puppeteering sticks in plain view. The comments on YouTube are interesting. Some gripe about dumbing down the subject, others say it really engaged them. The view counter tells the real tale, though - about 29,000 views within two weeks. Technical, dense explanations don't get that kind of traffic. Really nice work, on many levels. The Technology Alliance Group invited me to talk about information overload last week. There's a great McLuhan quote - perhaps apocryphal - something like "We don't know who discovered water, but we're pretty sure it wasn't the fish." Asking just about anyone about information overload is pretty much like asking a fish about water - me included. However...having thought about this quite a bit, I think it's a bigger issue than we realize. The Library of Congress adds about 11,000 volumes per day - total to date, 32 million. 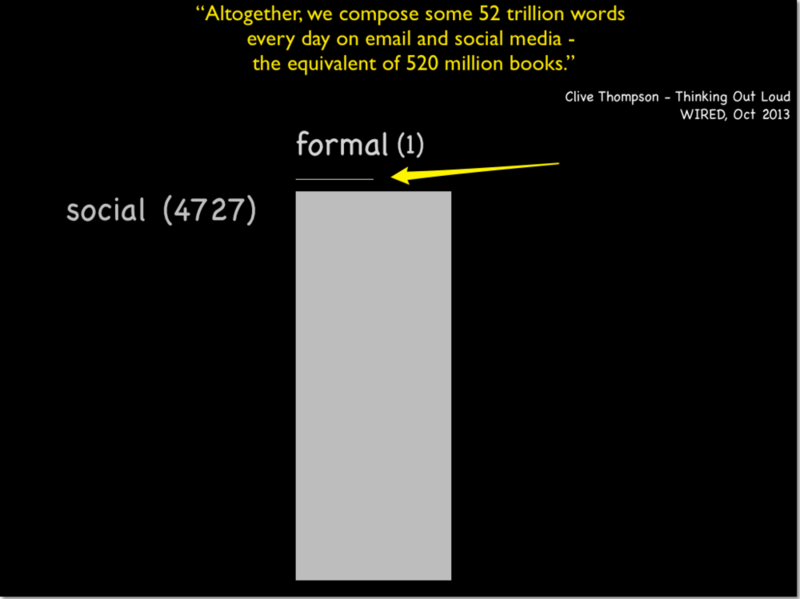 Clive's estimate is the equivalent of 520 million books. What we used to think of as formal knowledge - the stuff that goes in library - is outweighed thousands-fold by the social stuff. But wait, it gets more interesting. LOC has 32 million volumes. Founded in 1815 - 198 years ago. Multiply by 365 to get 442 volumes per day, on average. But the current rate is 11,000 per day. Has the rate of acquisition of formal knowledge gone up? Sure - dramatically. I think we're creating a problem that we're not quite culturally ready to 'fess up to (except Ray Kurzweil & his fans.) Overload? The word doesn't really capture the issue, does it. It has a sense of voluntary taking-on-a-bit-much, with a smidge of pride. We're not "overloaded" - we are incapable of handling this much information in the ways we've handled information for the past 500 years or so. If you deal with information and knowledge in your profession, you're rightfully proud of both the knowledge you've got, and your skill at adding to it. Saying "I can't keep up" doesn't really square with that very easily. Honestly, though - you're not "keeping up." I'm not "keeping up." The techno-centric response is to point at the knowledge tools we've added - search engines, software, "big data" tools, blah blah blah. No argument from me, take away my browser and suddenly I'm not half the borg I used to be. But I don't think my capacity for knowledge acquisition - for adding to what I know and associating it with what I knew - is 4,000 times greater than Grandpa had. It's probably the same; Jared Diamond says something to that effect in Guns, Germs & Steel as I recall - the guy whose life depends on plants and grass can make a huge number of distinctions, where an idiot like me just sees grass. Is this a waste of time in the face of the bitflood? Yes - and no. One of the reasons I like working with visual and narrative communication is that it often works when words don't. It's not a panacea - I don't know about you, but I've started to "read" infographics with the same impatient handling reserved for email. But it's at least an attempt to reframe communication challenges in light of this big contextual overload issue.